MNSC dinner at China Tang, hosted by Juliano. 1983 Ramonet Bâtard-Montrachet - caramelized nose, a little sweet on the edges, a little oaky, some Chinese licorie. Slightly acidic finish. Later on a little nutty. About 1½ hours later, showing sugary bubblegum notes. Nice and rich on the palate. Flight 1: opened for 1 hour before serving. 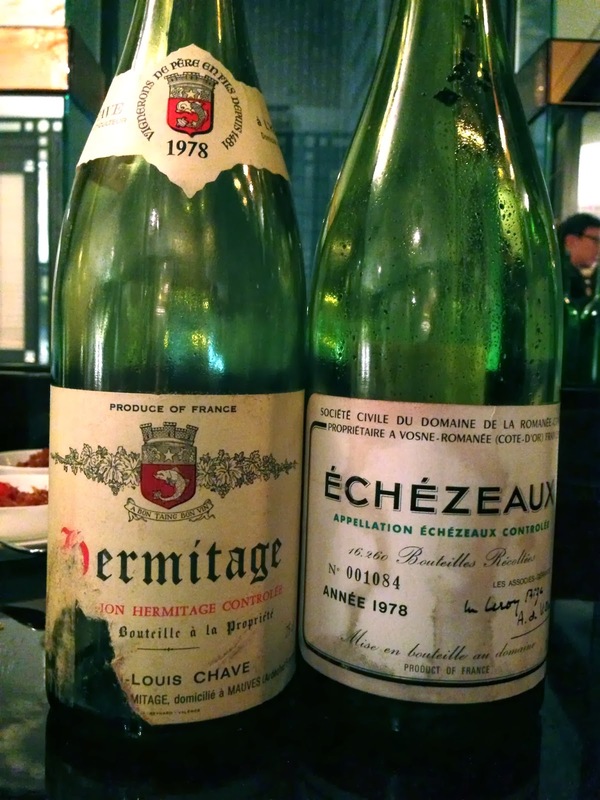 1978 DRC Échézeaux - beautiful nose, really sweet with black cherries. A little plummy towards the end. Sweet like candy, with a hint of savory black olives underneath the layer of sweetness. An absolutely beautiful wine, with floral, rose petal notes. 97 points. 1978 Chave Hermitage - richer and denser on the nose but still light on the body. More animal notes, slightly meaty, bloody, iron and minerals. A little smoky but more closed. 92 points. 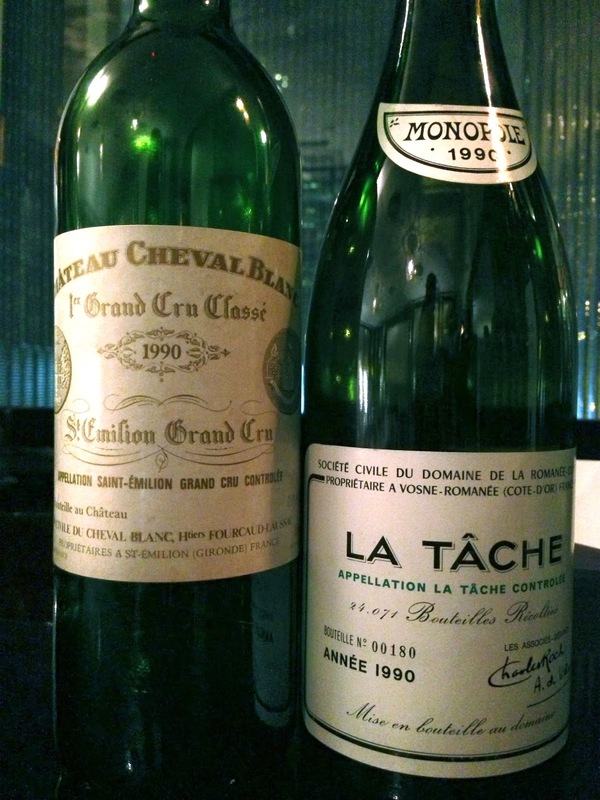 1990 Cheval Blanc - opened for 2 hours but decanted for 1 hour and 15 minutes prior to serving. Minty, smoky, nice and smooth on the palate but not light. Grassy and green notes, with lead pencil. 95 points. 1990 DRC La Tâche - opened for 2 hours but decanted for 30 minutes prior to serving. Sweet, a little exotic, coconut butter, plummy. 94 points. 1990 Pichon Baron - sweetish, seeming a little cooked, with green pepper. A little dusty and dirty. 93 points. 1990 Gruaud Larose - oaky, lead pencil, green pepper, plastic, sharp, a little moldy, stinky, smoky. A little corked. 90 points. 1990 La Mission Haut-Brion - smoky, savory with tea leaves. Very nice and classic. 96 points.